I have been using stylus for iPad ever since I started using iPad way back in 2011. I used to think that all stylus were created equal. Back then I used rubber tip stylus in pink. I really really want to use my iPad to replace my conventional notebook but somehow I felt like writing with a rubber tip stylus felt a little bit fake. So I stop using the stylus until I stumble across Adonit Jot Pro Stylus on youtube. Then my life totally changed. I can make going fully digital with my iPad a reality with Jot Pro Stylus. It's the kind of pen I might use on a daily basis. Even since than I've used and tried a few stylus which I think I might like and easy to find. This was the first Adonit product I purchased. I was very curious about the precision disc that this stylus used. I was very impressed with this stylus. I can write easily on my note taking app (GoodNotes and Note Plus). This stylus feels closer to writing on paper compare to the rubber tip stylus. I still use this stylus as a backup or when I don't want to use bluetooth to preserve battery life. The rubber grip on this stylus make writing much more comfortable. The issues I have with this stylus were the precision disc need to be replaced when you have used it over time and there are no palm rejection when using this stylus. I love Evernote and I was excited when I heard that Adonis has collaborate with Evernote to make Jot Script Evernote Edition. This stylus was made with Penultimate and Evernote in mind. This is much more expensive stylus compare to Jot Pro just because it used battery and bluetooth for it to work properly. When I first used it I do not have much problem but after awhile I have problem getting this stylus to stay connected with GoodNotes app. It's always disconnected and the battery life was horrible. Then last year I decided to try Jot Touch with PixelPoint. I heard only good things about it and some bad things about the issue with GoodNote app. After a few tweak, I totally love using this stylus with my iPad. This was still an expensive stylus compare to Jot Script Evernote Edition 1.0 because this iPad use rechargeable battery and bluetooth connect. This stylus doesn't work without turning on the bluetooth on your iPad. I used this stylus on daily basis and I am happy with it. I don't have disconnecting issue and the battery life last longer. I highly recommend this stylus if you are looking for a bluetooth, rechargeable battery and good palm rejection technology. 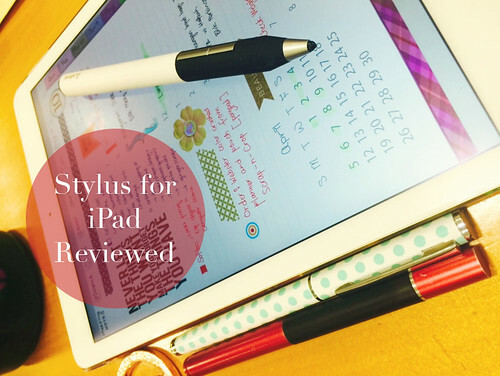 I hope this review will be of help if you are looking for stylus for your iPad. I am still waiting for a review from consumer about Jot Script 2.0 . I am not sure if I will get myself a new stylus. Finding a good and cheap stylus in Malaysia is not easy, even Machine Store only carry Adonit brand and some branches carry Bamboo. I haven't tried any other compatible brand just because it's very hard to find one here. I totally have a blast with this stylus especially when I used Digital Life Planner with Goodnotes as my main planner. It still feel as satisfying as when I use my Kikki.K Planner.